Pitt's Star Power Fuels New Orleans Rebuilding Actor Brad Pitt, who moved with his family to New Orleans a year ago, is spearheading a project to build affordable, safe and sustainable homes in the city's Lower Ninth Ward. He has committed $5 million of his own money to the effort. 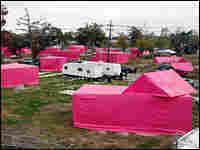 Pink structures resembling houses sit in New Orleans' Lower Ninth Ward as part of the Make It Right project. This home by Concordia Architecture was one of 13 designs chosen for the Make It Right project. See all of the designs. Actor Brad Pitt, who moved with his family to New Orleans a year ago, is spearheading a project to start rebuilding affordable, safe and sustainable homes in the city's Lower Ninth Ward. He has committed $5 million of his own money to get the Make It Right project going. 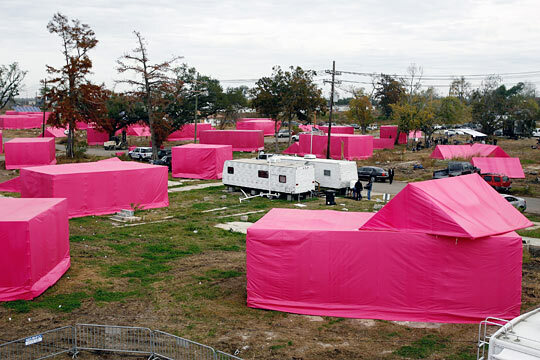 The project kicked off Monday with an art installation — shocking pink cubes, some the size of houses, scattered around the Lower Ninth Ward. 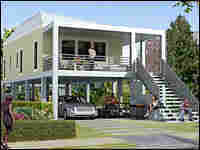 They symbolize the homes that once stood there, before Hurricane Katrina. "It's a small act of social disobedience, which makes it good fun," Pitt, in New Orleans, tells Melissa Block. "[The installation] probably spans about 11 blocks, and it represents the aftermath after the levee failure. It's a symbolic gesture of houses just being thrown by the hand of fate." 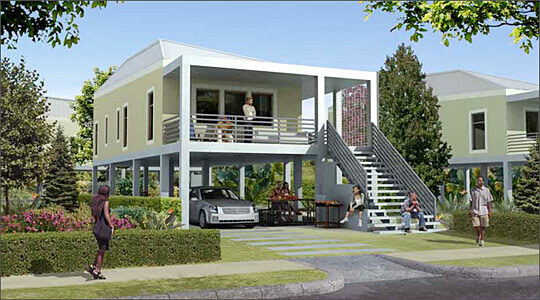 Pitt's project has unveiled 13 designs for houses — each about 1,000 square feet — all with front porches, built off the ground and with environmentally friendly features including solar panels. The goal is to start off with 150 homes, even though he acknowledges that number is just "a drop in the bucket." "There are 5,000 [homes] just in this neighborhood, and I don't want to be contained to just this neighborhood. This place needs help everywhere; every district needs help along the Gulf Coast still," Pitt says. He has been working on the Make It Right project for about a year. It called on leading architects to address the problems of the area, with an eye toward safety, sustainability, affordability and aesthetics.